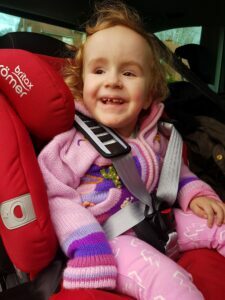 Disability vehicle specialist, Adapted Vehicle Hire (AVH), came to the rescue of a little girl with one of the world’s rarest medical complaints as her family hit severe mobility problems. Four-year-old Mary Allen, of Nantwich, Cheshire, was born with macrocephaly-capillary malformation syndrome (MCAP) – a condition that affects only 300 people globally and leads to severe physical and learning problems. She also suffers from hydrocephalus and epilepsy, which cause life-threatening seizures, and has spent her life in and out of hospitals, including Alder Hey Children’s Hospital in Liverpool and Leighton Hospital in Crewe. With two younger twin sisters, Pearl and Violet, both three, it is vital for mum, Donna Edge, to be able to get her young family to Mary’s many medical appointments safely. However, when her Toyota broke down, she was left unable to drive to Mary’s hospital visits. As Christmas approached with no respite in Mary’s busy schedule of medical appointments, Donna was desperate and contacted 14 vehicle hire companies to see if they could help. AVH, which is the UK’s largest provider of specialist rental vehicles for disabled motorists, emailed back within two hours and just days later, a new seven-seater Volkswagen Sharan was delivered to the family’s drive. This event was more than just a family celebration as the sights and sounds of the aquarium provided vital visual and sensory stimulation to help boost Mary’s development. AVH Managing Director, John Ellis, commented: “Having the right vehicle in the right place when you need it is invaluable and we were delighted to be able to help Donna in her time of need. AVH has a wide range of adapted vehicles ranging in size from Nissan Micras to 4x4s and people carriers. The company carries out its adaptations in-house, operating a purpose built workshop at its head office in West Drayton. To find out more about our adapted vehicles click here.